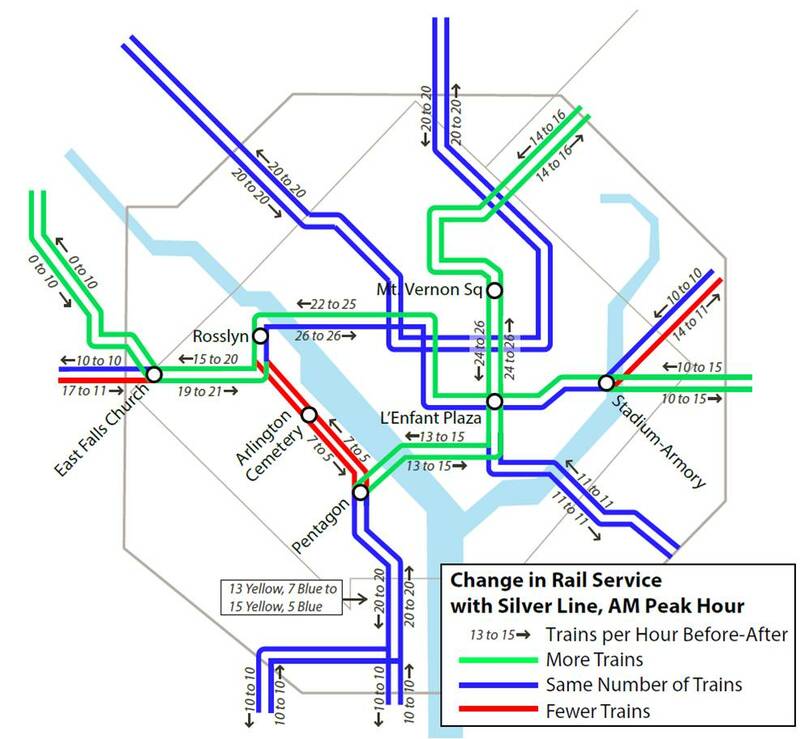 Recent and upcoming Metrorail service changes to accommodate the Silver Line have been in the works for over a decade, and are better for Blue Line riders than originally planned. Metro is considering a small fare increase and no changes to the fare structure for the FY15 Budget. Every autumn, Metro staff begins the process of developing the budget for the next fiscal year, which starts on July 1 of the following calendar year. Every other year, per Metro Board resolution, the budget proposal can contain a fare increase intended to match the fares to the changes in the consumer price index (CPI). 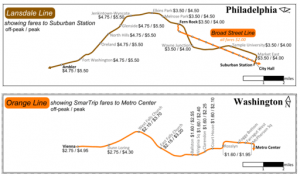 Comparison of SEPTA heavy rail and commuter rail fares and distances to Metrorail’s Orange Line, credit Matt Johnson via Greater Greater Washington. Click image for original context. More than three years ago, Metro developed a new ridership and revenue model that allowed us to better evaluate the ridership and revenue impacts of potential changes to our fare structure. Staff used this model to evaluate concepts that could be incorporated into the FY13 budget to increase the alignment between fares and our fare policy principles. Metro seeks to reduce delays to Metrobus caused by on-board SmarTrip card loading by installing off-board SmarTrip® Recharge Stations at key locations across the region. Metro has been quite successful at increasing the use of SmarTrip® card usage on both bus and rail. As noted in a previous post, many initiatives — including surcharges for paying cash — have been successful at raising the the SmarTrip® use rate to about 90% on both Metrorail and Metrobus. As many readers have noted, many Metrobus customers load small amounts of cash — enough for one or two trips — onto their SmarTrip card in order to avoid the surcharge. This on-board load transaction can take between five and 30 seconds and, on average, one out of every 14 trips on Metrobus involves a small value load. On some routes it’s as frequent as one out of every seven. This behavior results in longer dwell times, slower rides, and less efficient operations of Metrobus. One possible solution is to increase the opportunities for loading value onto SmarTrip cards before the customer boards. While SmarTrip cards can be reloaded online, at Metrorail stations and at a variety of retail outlets around the region, the frequency of on-board loading indicates the need for additional, convenient opportunities to add value to SmarTrip cards. Example of potential SmarTrip Reload Station size and location. Image updates every 5 seconds. Click image for larger version. Metrorail charges you the lowest possible fare, even if other trips that seem longer are less expensive. Recently a Twitter user asked a simple question: when traveling from King St-Old Town why does it cost more to travel to McPherson Sq than to Metro Center? 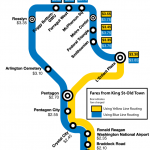 As a straight shot on the Blue Line, McPherson Sq is closer than Metro Center, so why is the trip to Metro Center cheaper? We recently described how Metrorail fares are calculated. However, the previous post failed to mention is that when there are two or more routes to travel between any pair of stations Metro uses the least expensive one. Metro first rolled out SmarTrip® on rail in 1999, breaking new ground as the first contact-less smart card used for transit in the United States. Metro began rolling out SmarTrip® on bus in 2002 and then to Metrorail parking facilities in 2004. While the utility of SmarTrip® was immediately obvious to many customers, others required a bit of encouragement to switch to the fare media that is most cost-effective for Metro and customers alike. 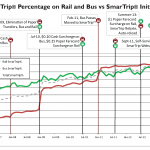 Usage of SmarTrip® on rail has been growing steadily since its launch, but use on bus seemed to plateau around 20% on bus starting in about July 2006 until about January 2008. That was the date when Metro began its first major initiative to encourage people to move to SmarTrip by implementing a $0.10 surcharge for using cash on bus. Since then, Metro has rolled out new SmarTrip features and additional incentives to continue the increase in SmarTrip use rate. In a recent post we described how Metrorail fares are calculated. The previous post noted that Metro’s Fare Policy Principles have established guidelines for how fares are structured. When it is time to evaluate changes to Metrorail, Metrobus, and MetroAccess fares, Metro staff revisit the fare policy principles to look for guidance. The challenge for Metro staff is to explore fare concepts that strike balance between the different principles. For example, Metro uses surcharges to encourage use of SmarTrip™ which is our most cost-effective fare media (principle #6), but the surcharges provide challenges to easily determined fares (principle #2). 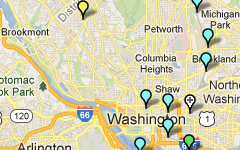 Note that Metro’s distance-based fares are considered more equitable than flat fares. Average income increases with distance from the core in the Washington region, so a flat fare would result in the highest per-mile fares for those groups who are the least able to pay them. Metro’s Board of Directors understands this and has emphasized fare equity (principle #4) as one of its top priorities. Surcharges for not using SmarTrip™: Metro charges $1 per trip for using paper farecards on rail and $0.25 per trip for using cash on the bus. These surcharges have helped push usage of SmarTrip™ up to about 90%, resulting in the reduction of fare collection costs. Different fares on different levels of service: Metro charges $1.60 base fare for local and MetroExtra services. Buses that travel long distances on freeway lanes cost users a higher fare ($3.65) to correspond with the greater travel speeds. 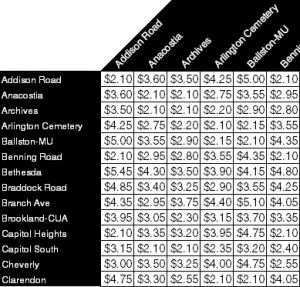 Metro’s longest distance bus routes, which travel to Dulles and BWI airports, charge a $6 fare per trip. MetroAccess fares are priced at twice the fixed route fare with a cap at $7. This fare structure is intended to encourage use of the existing fixed route capacity Metro offers, which are available to MetroAccess-eligible customers free of charge. The peak-of-the-peak (POP) rail fare surcharge, enacted in August of 2010, charged customers an extra $0.20 to enter the system during the peak 90-minute periods during the AM and PM peak. This surcharge was another example of using fares to “optimize the use of existing capacity.” However, riders informed Metro this fare concept impacted fare policy principles #1 and #2, customer satisfaction and allowing customers to easily determine fares. In the end, these two policy principles won out and the POP surcharge was eliminated starting July 1, 2012. What fare concepts might help better align Metro’s fares with the fare policy principles? What ideas have other agencies implemented that you’d like to be considered for Metro? Unlike older subway systems in the United States, Metrorail uses “distance-based” fares, meaning the farther you travel, the more you pay. While a flat-fare system may be simpler, Metro has established fare policy principles that put a priority on equity rather than simplicity. Peak Fares: Peak rail fares are based on distance traveled (calculated to the one-hundredth of a mile). The first three miles have one base fare, the next three miles have an incremental fare per mile, and smaller incremental fare is charged for the remaining distance. The resulting fare is rounded to the nearest $0.05 and is then capped at $5.75. The peak fares are show in the chart above as the blue line. 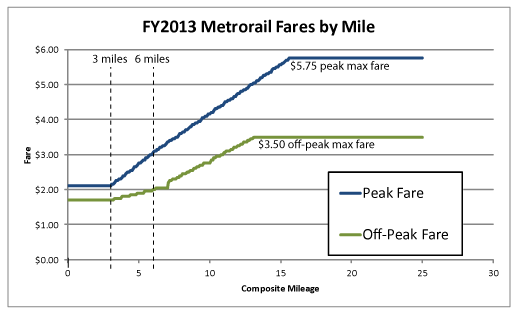 Off Peak Fares: Prior to July 2012, Metro peak fares and off-peak fares were calculated differently. Off-peak fares were fixed at three tier-based fares: short, medium and long-distance trips. This presentation on the development of a fare model (PDF) describes the old fare structure in detail. 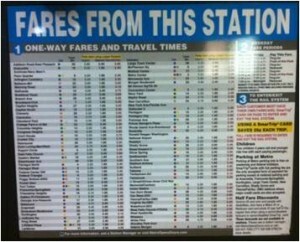 The most recent fare increase changed the off-peak fare structure to be more like the peak fare structure, with off-peak fares generally a 25% reduction from peak fares. Current off-peak fares are show in the chart above as the green line. The table below shows the peak and off-peak fare increments for Metro’s non-discounted full fares. Senior citizens and DC students, for example, receive fare discounts. Table 1: Metrorail “full fare” fare structure, FY13.